This program has numerous components to it: a culture presentation from both countries, a science presentation from both schools, a visit to NYC by the Japanese students, and a visit to Nagoya by BHSEC students. The program will not be fully completed until March, when BHSEC students travel to Nagoya and present their work. The Japanese visit to BHSEC was a success, and the students from Nagoya were able to gain insight on the American school system, practice their English, visit NYC, and bond with their exchange partners. 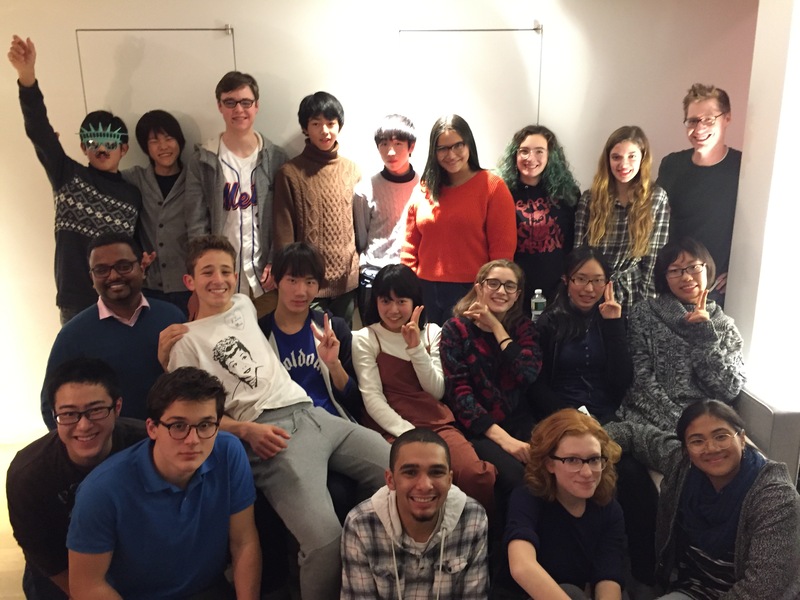 The Japanese students arrived at JFK on Saturday December 10th, and spent the rest of the day relaxing and getting to know their host families. On Sunday, however, the students had a busy day with the entire group sightseeing in NYC. The group visited Times Square, the Bryant Park winter village, the New York Public Library, and Grand Central Station. On Monday, the Japanese students were also able to experience an entire school day at BHSEC, which, unfortunately, most of them found surprisingly boring. Fortunately, on Tuesday, the students had a fun time visiting the Statue of Liberty, Ellis Island, and exploring Downtown Manhattan, which all of them enjoyed greatly. The guests were also able to explore the scientific side of NYC on Wednesday, such as when they visited a laboratory at CUNY. In the laboratory, the students were able to dissect rats, which some of them found quite interesting. However, as might be expected, a few were not as enthusiastic about the dissection. On Wednesday the Japanese visitors also presented their culture presentation to a group of BHSEC students and faculty after school. The culture presentation included a variety of interesting and fun topics including Japanese food, holidays, common misconceptions made by Japanese people, and origami. The Japanese brought numerous delicious snacks from Japan for their culture presentation, which were greatly enjoyed by the BHSEC students in attendance. In addition, the culture presentation did not lack fun hands-on activities; the Japanese students and teachers taught BHSEC students how to make a variety of fun origami. On Thursday, the Japanese students finally presented their science presentations that they had been preparing for months. The science presentations included numerous interesting and complex projects, including topics such as surface tension, slime mold, and hand warmers. On Friday, the Japanese visited the American Museum of Natural History and Central Park, which they all loved. On the same day, the entire Japan Exchange group enjoyed a farewell party to say goodbye to the Japanese students who then left on Sunday. The students’ last full day was spent having fun and enjoying last minute sightseeing of NYC with their host families. The Japanese left on Sunday with a mixed feeling of sadness for leaving NYC and their newly gained friends, as well as happiness about returning to their families. Overall, the Japanese visit was great success and a life-changing experience for all the host families here in New York. Ori, 10th, reflects on his experience: “Through the program I made an incredible friend with someone who lives halfway across the world and who I would never have known otherwise. This friendship has been the greatest learning point of this incredible program.” The BHSEC students look forward to reuniting with their exchange partners later this semester. The Japanese students and their partners at the farewell party before their departure.